Biocluster is the High Performance Computing (HPC) resource for the Carl R Wose Institute for Genomic Biology (IGB) at the University of Illinois at Urbana-Champaign (UIUC). Containing 2824 cores and over 27.7 TB of RAM, Biocluster has a mix of various RAM and CPU configurations on nodes to best serve the various computation needs of the IGB and the Bioinformatics community at UIUC. For storage, Biocluster has 2619 TB of storage on its Ceph filesystem for reliable high speed data transfers within the cluster. Networking in Biocluster is either 1 or 10 Gigibit ethernet depending on the class of node and its data transfer needs. The storage system is a CEPH filesystem with 2.4 Petabytes of disk space. This data is NOT backed up. The data is spread across 15 CEPH storage nodes. The cost for each job is dependent on which queue it is submitted to. Listed below are the different queues on the cluster with their cost. Usage is charge by the second. The CPU cost and memory cost are compared and the largest is what is billed. Please fill out the form at http://www.igb.illinois.edu/content/biocluster-account-form to request access to the Biocluster. Running jobs on the head node or login nodes are strictly prohibited. Running jobs on the head node could cause the entire cluster to crash and affect everyone's jobs on the cluster. Any program found to be running on the headnode will be stopped immediately and your account could be locked. You can start an interactive session to login to a node to manual run programs. Installing Software Please email help@igb.illinois.edu for any software requests. Compiled software will be installed in /home/apps. If its a standard RedHat package (rpm), it will be installed in their default locations on the nodes. Creating or Moving over Programs: Programs you create or move to the cluster should be first tested by you outside the cluster for stability. Once your program is stable, then it can be moved over to the cluster for use. Unstable programs that cause problems with the cluster can result in your account being locked. Programs should only be added by CNRG personnel and not compiled in your home directory. Reserving Memory: SLURM allows the user to specify the amount of memory they want their program to use.. If your job tries to use more memory than you have reserved, the job will run out of memory and die. Make sure to specify the correct amount of memory. Reserving Nodes and Processors: For each job, you must reserve the correct number of nodes and processors. By default you are reserved 1 processor on 1 node. If you are running a multiple processor job or a MPI job you need to reserve the appropriate amount. If you do not reserve the correct amount, the cluster will confine your job to that limit, increasing its runtime. You will need to use an SSH client to connect. Hit Open and login using your IGB account credentials. 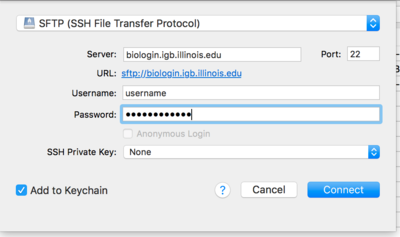 Type in ssh username@biologin.igb.illinois.edu where username is your NetID. Hit the Enter key and type in your IGB password. The cluster runs the SLURM queuing and resource mangement program. All jobs are submitted to SLURM which distributes them automatically to the Nodes. You must first create a SLURM job script file in order to tell SLURM how and what to execute on the nodes. You just created a simple SLURM Job Script. To submit the script to the cluster, you will use the sbatch command. #!/bin/bash - tells linux this is a bash program and it should use a bash interpreter to execute it. #SBATCH - are SLURM parameters, for explanations of these please scroll down to SLURM Parameters Explanations section. Note: the module commands are explained under the Environment Modules section. #SBATCH -D /tmp/working_dir Run the script from the /tmp/working_dir directory. This defaults to the current directory you are in. #SBATCH -e /path/to/errorfile Split off the error stream to this file. By default output and error streams are placed in the same file. #SBATCH -o /path/to/ouputfile Split off the output stream to this file. By default output and error streams are placed in the same file. #SBATCH --mail-user username@illinois.edu Send an e-mail to specified email to receive job information. #SBATCH --mail-type BEGIN, END, FAIL Specifies when to send a message to email. You can select multiple of these with a comma separated list. Many other options exist. #SBATCH -N X Reserve X number of nodes. #SBATCH -n X Reserve X number of cpus. #SBATCH --mem=XG Reserve X gigabytes of RAM for the job. Use the ```srun``` commsnf if you would like to run a job interactively. This will automatically reserve you a slot on one of the compute nodes and will start a terminal session on it. Closing your terminal window will also kill your processes running in your interactive srun session, therefore it's better to submit large jobs via non-interactive sbatch. This command brings up a list of your current running jobs. The first number represents the job's ID number. This will return a list of all nodes, their slot availability, and your current jobs. This will show all queues as well as which nodes in those queues are fully used (alloc), partially used (mix), unused (idle), or unavailable (down). Note: You can only delete jobs which are owned by you. When submitting a job using a sbatch script you will have to add the module load qiime/1.5.0 line before running qiime in the script. Download WinSCP installation package from http://winscp.net/eng/download.php#download2 and install it. 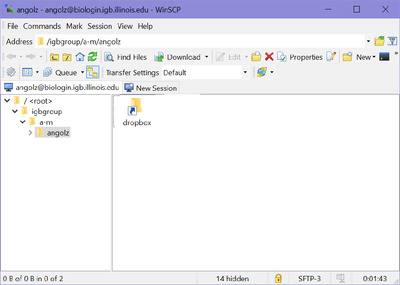 Once you hit "Login, you should be connected to your Biocluster home folder, as shown below. From here you should be able to download or transfer your files. To download cyberduck go to http://cyberduck.c and click on the large Zip icon to download. Once cyberduck is installed on OSX you may start the program. 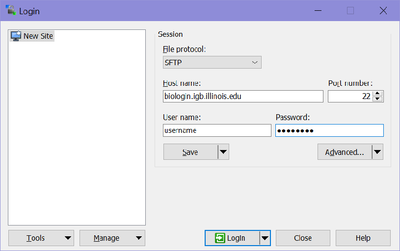 Now in the Server: input box enter biologin.igb.illinois.edu and for Username and password enter your IGB credentials. You may now download or transfer your files. Globus allows the transferring of very large files reliably. 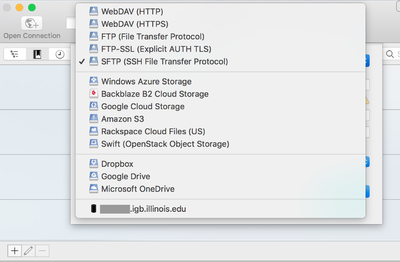 One option to transfer data from the Biotech FTP server is to use a program called sftp. It can download 1 file or an entire directory. Replace USERNAME with the username provided by the Biotech Center.